The historical background of this reenactment event is the Cologne Diocesan Feud or Neuss War in the years AD1474 to 1475. 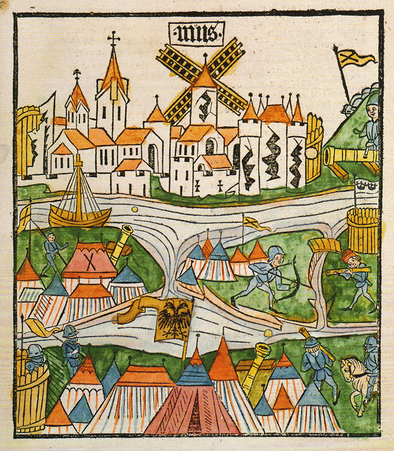 Reason for the conflict was a dispute between the Archbichop of Cologne, Ruprecht of the Palatinate and the cathedral chapter of Cologne on the raising of the tax collection at the river Rhine at the town of Zons. The Archbichop allied with the mighty duke of Burgundy, Charles the Bold andthey started a war involving the cathedral chapter of Cologne and also the Emperor Frederick III. and the Holy Roman Empire. In the course of the conflict they besieged the town of Neuss for almost 10 months with the troops of Burgundy and their allies, the most advanced army in Europe. The city of Neuss resisted all attacks and the war ended with the arrival of the imperial troops with 40.000 men at Zons. It is indicated that there also has been an attack on Zons during this conflict which is reenacted in the "Sturm auf Zons" by 300 european reenactors. We are looking forward to see you in Zons.